Adding a dash of cinnamon, a pinch of red pepper, or a sprinkle of ginger to culinary creations may offer benefits in addition to flavor. 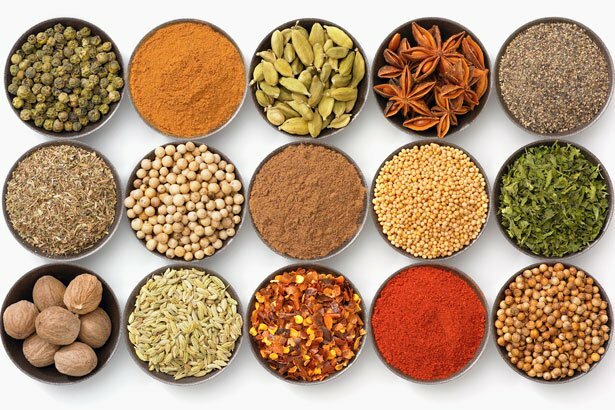 With the increasing interest in functional foods, the latest research shows that spices and herbs offer a number of possible health benefits. The table below focuses on a few popular spices and herbs and explores the research on potential health benefits. Suggestions for spice and herb use are also included. There is a reason to season! Ginger • Ginger is the dried knobby shaped root of the perennial herb Zingiberofficinale. • Once the leaves of the plant die, the thick roots, about 6 inches long, are dug up and sold as ginger root. • Possibly effective in treating painful menstruation, morning sickness, osteoarthritis, post-op nausea and vomiting, and vertigo • Inconclusive evidence to support chemotherapy-induced nausea and vomiting, migraine headache, myalgia, and rheumatoid arthritis • Used in Indian curries, and Chinese, Japanese, and European spice blends • Used in popular baked goods including gingerbread and ginger snap cookies • Ginger Ale, a sweetened beverage refreshment • Often accompanies sushi to clean the palate. Curcumin • Curcumin (also referred to as turmeric) is derived from dried rhizomes of the herb Curecuma longa. • Curcumin is a member of the ginger family and is a polyphenol. • Possibly effective in treating indigestion and osteoarthritis • Inconclusive evidence to support Alzheimer's disease, colorectal cancer, anterior uveitis (eye swelling), rheumatoid arthritis, and skin cancer • Little reliable evidence to support its use for any health condition because few clinical trials have been conducted. Often an important ingredient in curry mixes. Add a pinch to jazz up egg salad. Used in many Moroccan dishes. Pairs well with chicken, duck, turkey, vegetables, rice, and salad dressings.